Caraway rye is one of my favorite breads. I’ve only recently gotten into baking bread and the whole process fascinates me. I feel like I have just started scratching the surface with my knowledge of bread making, yeast, etc. I feel like I could study breadmaking for years and years and still not understand everything about bread. But I will surely enjoy learning and making batch after batch of delicious homemade bread. We hardly ever buy bread anymore and when we do, I always try to get it from the bakery. I can no longer stand the bread that has a 3 week shelf life because it’s pumped full of additives. *barf* It’s so bland and it explains why I didn’t eat much bread growing up. This recipe produces 2 loaves of dense, soft bread. 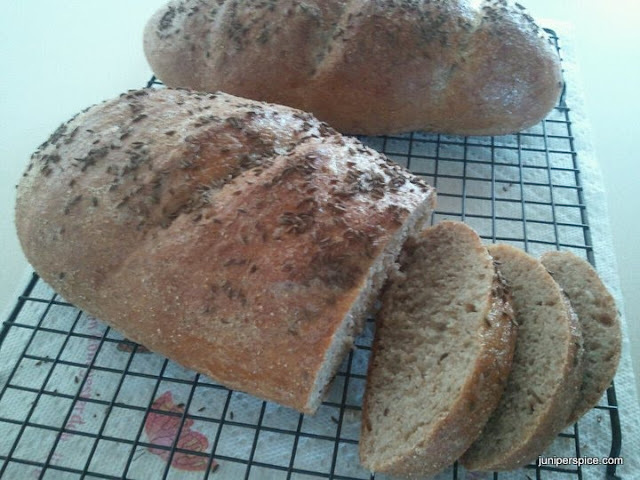 I love the taste of caraway but I’m thinking of omitting the caraway seeds on top of the bread – they get very hard and crunchy during baking and get stuck between your teeth. Best to maybe just stick with the seeds that go into the recipe. Caraway Rye Bread, adapted from All Recipes. Makes 2 loaves, can easily be doubled. 1. In a medium bowl, add warm water, yeast, and sugar. Give it a quick stir and let sit (proof) for 10 minutes. 2. Add the 1 tbsp. caraway seeds, salt, rye and bread flours. Stir until just combined and the dough holds together. 3. Lightly flour a clean surface and turn dough out. Adding extra bread flour as necessary, knead dough until smooth and elastic, about 8 – 10 minutes. 5. Grease a large baking sheet or cover in parchment paper. Once doubled, divide dough in two halves. Form each half into a rustic loaf, about 3 inches in width and height and 10 inches long. 6. Put the loaves on the baking sheet and cover with dish towel. Return to the warm place for another 30 minutes or so. The loaves should double in size again. 7. Once risen, pre-heat the oven to 400º [if your loaves are rising in the oven, make sure to remove them before preheating]. 8. Cut 3 diagonal slashes in the top of the bread, evenly spaced. Brush egg and water mixture over the top of the loaves. If using, sprinkle 1 tsp. of caraway seeds over each loaf. 9. Bake for 30-35 minutes, rotating pans after 15 minutes, until browned. Cool on wire racks. As a side note – this bread makes wonderful garlic toast! Take about 4 tbsp. softened butter, smash/chop up 2 cloves of garlic and mash and mix together – it doesn’t have to be precise. Take 5 or 6 slices of this brad and slather the garlic-y butter on both sides. Bake on a cookie sheet at 350º about 6 minutes on each side. Let sit for a couple minutes and enjoy. So tasty with homemade turkey meatballs and marinara sauce on whole-wheat spaghetti – recipe coming soon!